When NASS Member Ian Wimpenny was diagnosed with AS in 2013, he was determined not to let it interfere with his passion for sport. Here, he shares his experience of the Barceolna triathlon, where he raised over £3,000. It was an absolutely amazing event, and could not have gone any better for me. The ocean swim was amazing in crystal clear, calm waters and I managed 3.8km course in 47mins 37secs, posting the fastest swim split of the day – I even beat all the pro-athletes! On to to the 180km bike course, which was 2.5 laps of a course which was slightly undulating at the start but largely flat and fast thereafter. Having spent my time training on British roads, the Spanish roads seemed so smooth by comparison. I felt generally good on the bike, but did suffer some lower back and hip pain through trying to hold the aero position for so long. I relieved this by getting out the saddle each time I had to go up hill. I completed the bike section in 5hrs 16mins, and apart from the odd ache and pain everything had gone perfectly to plan. Then finally on to the marathon, which was a 3 loop course along the sea front. It took about 5km to get the legs going, but once I got in to my stride I felt good up to about 20km. 20km through 30km was my real low point and I felt myself slowing down and had some pain between my shoulder blades and rib-cage. I also had a few blisters, but I kept pushing on even if I wasn’t going quite the speed I had been. With 7km to go, I felt like I could see the light at the end of the tunnel and with my spirits lifted made a final push for home. The last 1km or so was absolutely sensational, the anticipation and knowledge that you were going to complete the event, coupled with the crowd, music and lighting sent the adrenalin levels off the scale! I will never forget my run through the finish chute, it was a very emotional experience. I finished the marathon in 3hrs 49mins and ended up with a total time of 10hrs 3mins which I was over the moon with. 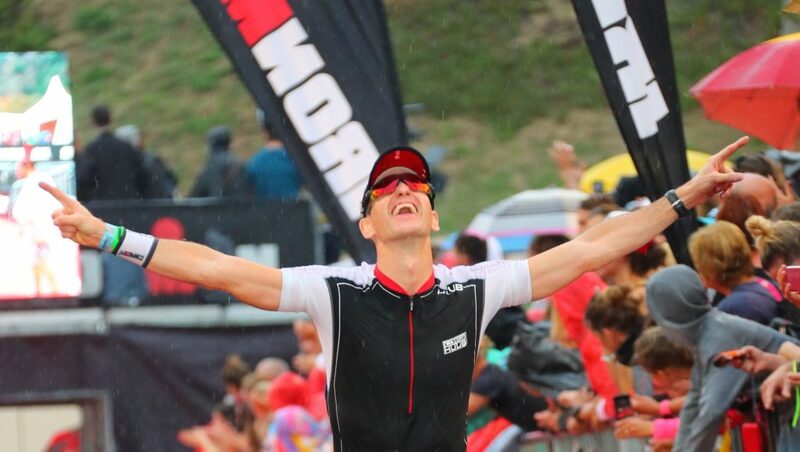 As the announcer said “Ian, you are an Ironman!”, with obvious exceptions, this was one of the best moments of my life, and something I never dreamed I’d hear 4 years ago when I was floored by AS. Words cannot describe that feeling – my finishing photo attached goes someway to showing it though. One of the biggest things that I will take away from this experience is that no matter how desperate and negative a situation can feel, with the right mind set and application these can be turned into positives. We should never give up!